• CA certificate in PEM — An ASCII (textual) certificate format commonly used by Microsoft operating systems. Select this format if the certificate is to be used on another Smoothwall. To authenticate a signed certificate produced by a non-local Certificate Authority, you must import the non-local Certificate Authority’s certificate into the Smoothwall. Typically, you do this on the secondary Smoothwall so that they can authenticate certificates created by a master Smoothwall’s Certificate Authority. 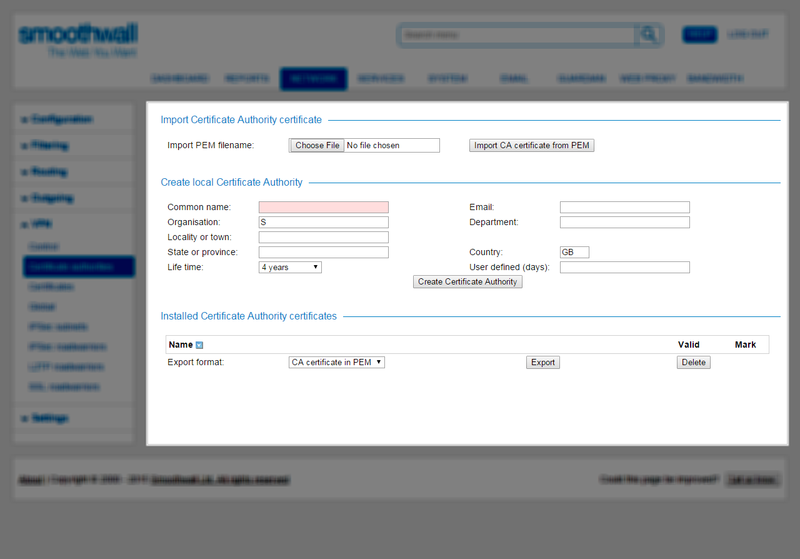 The Certificate Authority certificate no longer appears in the Installed Certificate Authority certificates panel, and the Smoothwall cannot authenticate any certificates created by it. Once the local Certificate Authority has been deleted, the Create local Certificate Authority panel appears. This change in layout occurs because a Certificate Authority no longer exists on the Smoothwall. The Create local Certificate Authority panel replaces the Delete local Certificate Authority panel.